I used the Chubby Chum Pals stamp set and the matching Chums Pals Icons dies. I adhered the googly eyes with Glossy Accents and cut the 2 panels with MFT Blueprints dies. The twine is Chocolate Truffle Trendy Twine and the sentiment is also from the Chubby Chum Pals set. And also for SSS Wednesday Challenge – Anything Goes. And it will be sent to Brianna Devine, who is having open heart surgery on January 6th. I hope she likes it! And I hope you like it, too! TFL! You can see the full post and video over at the YNS Blog. I hope to see you there! P.S. This is also for Tuesday Morning Sketches – Anything Goes (but try to challenge yourself). I haven’t made one of these tent cards in ages and the acetate strip idea is new. I hope you like it and TFL! I used the leaf branch Beautiful Blooms and a sentiment from Mega Mixed Messages. The stitched fishtail tag is from YNS, the dotted butterfly die and heart die are from Spellbinders and the vellum butterfly die is Papertrey also. 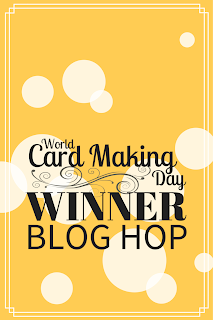 This is for Make It Monday – Sympathy Cards and Stamped Borders and Loves Rubberstamps – Anything Goes. I hope you like it and TFL! I used the partial die cutting technique with the Flap Happy stamps and Butterflies 3 dies. I also paper pieced the butterflies. I stamped the background paper and the right strip of cardstock with the same sentiment from Compact Sentiments - Part Two. Finally the side panels were adhered with foam tape. I used the Feeling Fruity stamp set from Whimsy Stamps and the matching Fruit Trio die set. I used some Doodlebug Fruit Stand paper and a circle and sentiment from the same set. The strawberry die does not come with a solid backer to make the black seeds so I just cut one by hand and glued it to the back. I stamped the Mama Elephant Arctic Penguins and fussy cut them out. I do have the matching dies, but I decided I wanted them without their ice skates so I did it by hand. The balloon is from Party Kit, the sentiment is from Remember December, and the snowy hills were die cut with Landscape Trio. The cloud embossing folder was from Stampin’ Up! I used the Houses on a Hill die, the Snowfall stamp set, and the Waddles - Snow Fun stamp set for the sentiment. I cut the Houses on a Hill out and used Copics to give them tiny little Christmas lights. The kraft panel was stamped with the large snow stamp and the sentiment was stamped with Versafine Onyx Black ink. I’ll have the start to finish video up on the YNS Blog for Whatcha Watching Wednesday. This is also for CASology - Snow and SSS Wednesday Challenge - Winter Inspiration. 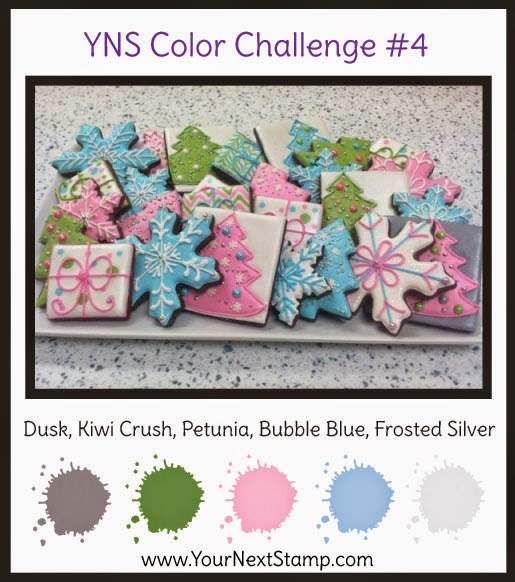 Please stop by the YNS Blog to see all the Feature Day projects from the DT and comment there for your chance to win! TFL! Congratulations Mary-Anne V! Please email me your address (link is in the sidebar) by December 27th and I will also email you. I used the image Little Santa from Aurora Wings and created a sentiment using PTI’s Simple Alphabet set. He was colored entirely with Copic markers and I used a Spellbinders die to finish off the card. I used 3 different WMS sets for this card: Very Vintage Labels No. 4 (frame), Gift Card It (sentiment), and Vintage Circles, Small (tree). Here’s how I made the tree – I stamped and image from Vintage Circles onto striped green paper and cut it out with a petite scalloped circle die. Then I cut it up so I had a triangle shape, plus a little bit extra on each side. I folded the extra bits to the back and taped them together, then I glued in a little scrap of brown cardstock for the trunk. I hope you like it and TFL! Once again, I used the Very Vintage Christmas stamp set (can you tell I just love this set?!). I cut a panel from kraft cardstock with my Zing and stamped it with the tag image in white ink. I also stamped a sentiment from the same set. I added a bow and set it aside. Next I die cut a white cardstock panel and stamped it all over with the snowflake from the set in light blue ink. Then I put all the pieces together to make my card. The sketch is from Freshly Made Sketches. This is also for Little Red Wagon – So Flaky. I hope you like it and TFL! I used Very Vintage Christmas again, but decided to showcase my 2 boys’ school pictures. I cut out the frame shape with my Zing and stamped and embossed with gold. I stamped a little tag with 2014 and added a bow on top. I hope you like it and TFL! I used Very Vintage Christmas for the sentiment, leaves and berries. The sentiment was stamped with Versamark ink on white cardstock and embossed with gold EP, then cut out with a circle die. I stamped a ton of the 2 different leaves and colored them with Copics. Then I fussy cut them all out and put them off to the side. I used 2 circle dies to cut a piece of thin chipboard to make a circular frame and glued the leaves to it to make the wreath. I then stamped the berry cluster 3 times, colored with Copics, and fussy cut out. I added a bow of May Arts ribbon and a hanging string of rustic twine. BTW – you can’t tell, but I adhered the wreath to the sentiment with foam dots for dimension. I hope you like it and TFL! Hi all! Today is the Waltzingmouse December Pajama Party – yay! So I’m going to be putting up a series of posts for it – hope you don’t mind! This is for Challenge #1 – 3D Christmas tree. I used the Large Tree dies from Some Assembly Required. I stamped a whole sheet of vellum with the snowflake from Very Vintage Christmas, then die cut all the tree pieces from the sheet. I assembled according to the instructions and made the box, also according to the instructions. I stamped a sentiment from Very Vintage Christmas on the box and embossed in white and stuck a battery powered tea light candle inside. I hope you like it and TFL! I used the super cute Tiny Violet Fairy, but colored her to be a poinsettia fairy instead! The sentiment is from Very Vintage Christmas. I stickled her wings and added pom-pom trim around the focal panel. I used the dinosaur from Party Posse and the Posse Icons dies from Paper Smooches. I also used a square Nestabilities to do the window/partial die cutting technique with the dinosaur. The dino was colored with Copics and I added some dots on his head with a Sharpie white paint pen. The happy birthday is from Sentiment Sampler and the Wish BIG is from Birthday Sampler. All the papers are from the Doodlebug Hip Hip Hooray paper pad and the sequins are from Neat & Tangled. 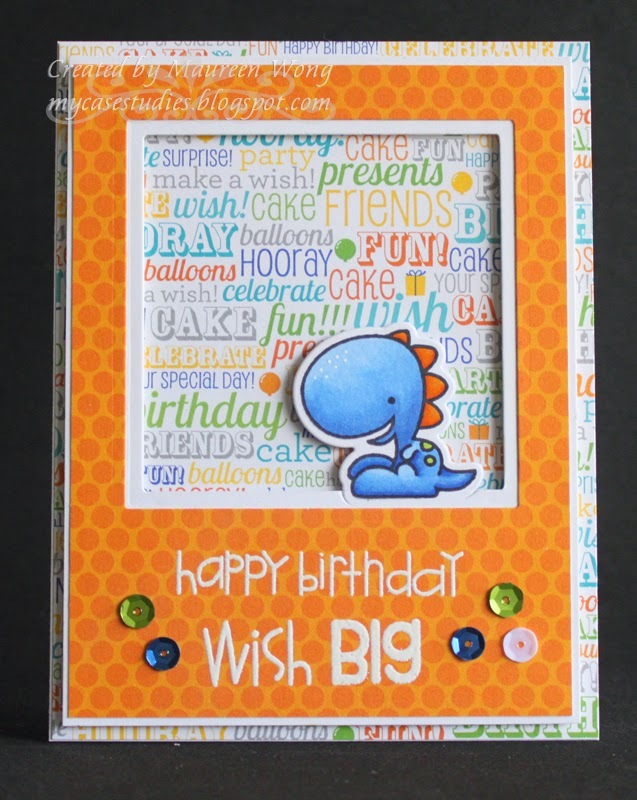 This is for the Paper Smooches SPARKS challenge – Anything Goes and Creative Card Crew – Birthday with a Sentiment. I hope you like it and TFL! I used the Ppinky Dolls image called Cold Days, a sentiment from Very Vintage Christmas, and the sketch from Sketch Saturday. The image was printed with my laser printer and colored with Prismacolor Pencils. I stamped the sentiment in Old Olive ink and the papers are really old from a company no longer around, Daisy Bucket. This is also for the Ppinky Dolls Facebook challenge – Winter Shabby Chic. Hope you like it and TFL! I used the Clink stamp set and the matching die. The “pink champagne” was colored with copics, as were the sparklers and the ribbons were colored with Prismacolor Pencils. I hope you like my card and video! Please check out the YNS Challenge Blog for all the details and more inspiration from the DT. TFL! I used the new set Boom! and the matching die set along with a card cutting file from Lori Whitlock. I paper pieced most of the firework with patterned paper and colored his arms, feet, and the fire with Copics. Finally I added some google eyes and popped him up on the card with foam boosters. I white heat embossed the sentiment on the center panel. 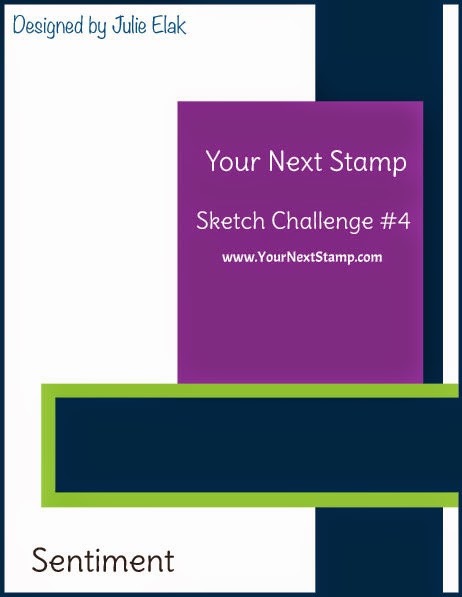 Please check out the YNS Blog for all the DT Dare cards and comment there for a chance to win a stamp set of your choice! TFL! I’m so excited about this release! I live in Hawaii and it can get really HOT most of the year, but Winter has such nice cool temperatures that it’s my favorite season! We have a bunch of new stamps and dies for you this month, and I am loving the Little Darlings, January and Aspen, and also all the stand alone dies to make fabulous scenes! Of course I’m always a sucker for stamps with matching dies and there are some of those in this release, too! Enough jibber jabber, let’s get on with the show! She was stamped with Versafine ink onto watercolor paper and watercolored with Inktense Pencils. I stamped one of the included sentiments in Versafine and mounted it on my card. I got this great kit from SVG Cuts called Christmas Box Cards and decided to use the plain snow globe file. I cut the base out of brown cardstock, then cut a couple pieces out of kraft. For the back kraft panel, I stamped it with the birch trees from Forest Friends and also the little bunny. Over that, I stamped the Snowfall pattern. Next I cut some snowy hills, animals and trees with the Forest Scene die set and assembled them into 2 layers which were added into the base. Finally, I took the little kraft bookplate and stamped it with snowflakes from Snowfall and a sentiment from Santa Express Train Carts. As always, there is a prize to be won: one person will win the Grand Prize of a $20 YNS gift certificate. One commenter will be chosen at random from all the blogs on the hop, so the more blogs you comment on, the better your chances to win! And now you’re off to Wendy’s Blog (link below), but don’t forget to leave me a comment before you go! Happy hopping! Hi all! It’s time for a sneaky peeky at what’s coming from Your Next Stamp this month! I’ve used the adorable January and the white embossing technique. In case you missed my video on it, CLICK HERE. The sentiment comes with January, and there are a couple others as well. Please check out the YNS Blog for all the designers who are peeking today! I hope to see you back here for our New Release Blog Hop tomorrow! TFL! Hi all! 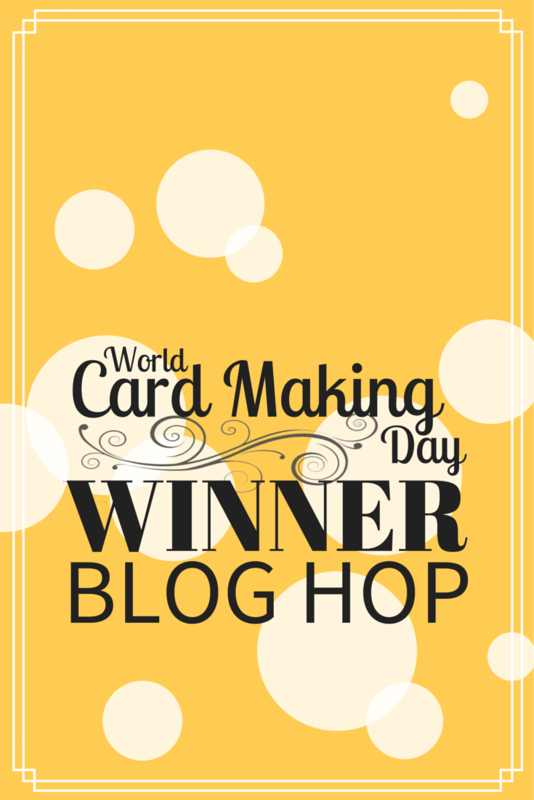 I’m so thrilled to be participating in this World Card Making Day Winners Blog Hop! If you’ve been following the links, you should have come here from Donna’s blog. If you just happened upon my blog, please go back to the Paper Crafts blog for a full list of blogs on this fun hop! 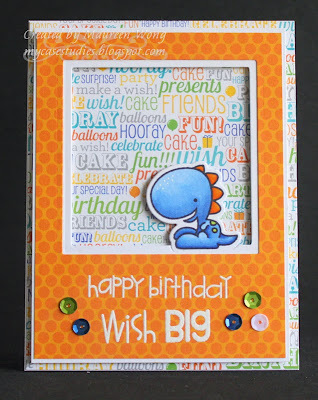 I used the Paper Smooches set Bee Mine and a Stampers Anonymous Honeycomb stencil. I sponged Wild Honey and Antique Linen Distress Inks through the stencil for the background. Next I stamped the bees on white cardstock and vellum. I colored the cardstock versions with Copics, then cut out both versions, leaving the wings off of the cardstock versions. I glued the cardstock bodies over the vellum versions and attached them to the card base with foam tape, slightly overlapping their wings. Finally I stamped the sentiments on the sides of the bees. There are a bunch of stamps, a few dies and some other miscellaneous items. To enter to win, please leave a comment for me about anything you’d like! Unfortunately this giveaway is only for people in the US, so please include which state you’re in. This giveaway is open until December 10th, 11:59 PM Hawaii time. I’ll announce the winner shortly after that. Now it’s time for you to hop over to Mandy's blog, but before you go, don’t forget to leave me a comment for a chance to win my prize package! I used a Ppinkydolls image called Winter Walk and the sketch from Tuesday Morning Sketches. The image was printed on my laser printer and colored with Prismacolor Pencils. I did the out of the box die cutting technique with a fishtail flag from Your Next Stamp. The embossing folder is from Stampin’ Up! and the sentiment is from the Santa Express Train Carts. I hope you like my card and TFL! Hi all! Today I am honored to be a Guest Designer over at CASology! My Design Defined: using dies with stitching detail adds interest to a simple design. The die I used is from MFT – Blueprints 15. The image and sentiment came from the Forget About the Cake set from The Cat’s Pajamas. I stamped them both with Versafine ink and colored with Prismacolor pencils. 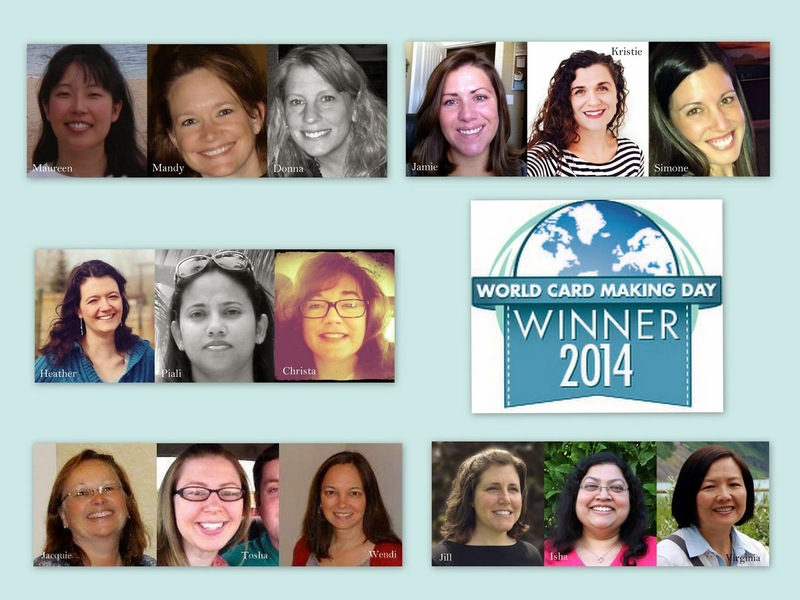 Please check out the CASology challenge for all the fabulous inspiration from the team! TFL!